I’ve been on a tempeh buying kick lately, which has forced us to dig through our cookbooks and memories for good tempeh recipes. 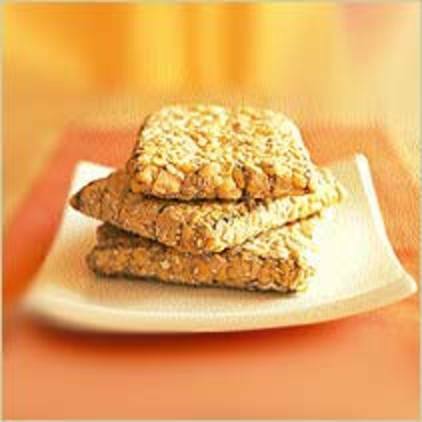 Tempeh is less processend than tofu, and thus it is healthier and higher in protein. We tend to eat a lot of tofu, so adding tempeh into our diet helps us cook beyond our usual meals. Of course, organic ingredients are a must! Server hot over organic buns. « Enter to Win a $40,000 Green Kitchen Giveaway! yummm! i am totally on a tempeh kick right now as well — can’t seem to get enough of it! thanks for the recipe, i will try it soon. Spicey is a fave here, and we’ve found when we use them with either tofu OR tempeh in our ‘Dare to Compare/gross out games for good nutrition, kids SWEAR it’s meat…it’s hilarious to do the ‘reveal’ at the end of the session. We get a lot of converts to ‘give it a go’ using the ‘Fear Factor’ technique…so I’ll try it out on our crew, thanks. Crush the souls of Girl Scouts will you? Karma.